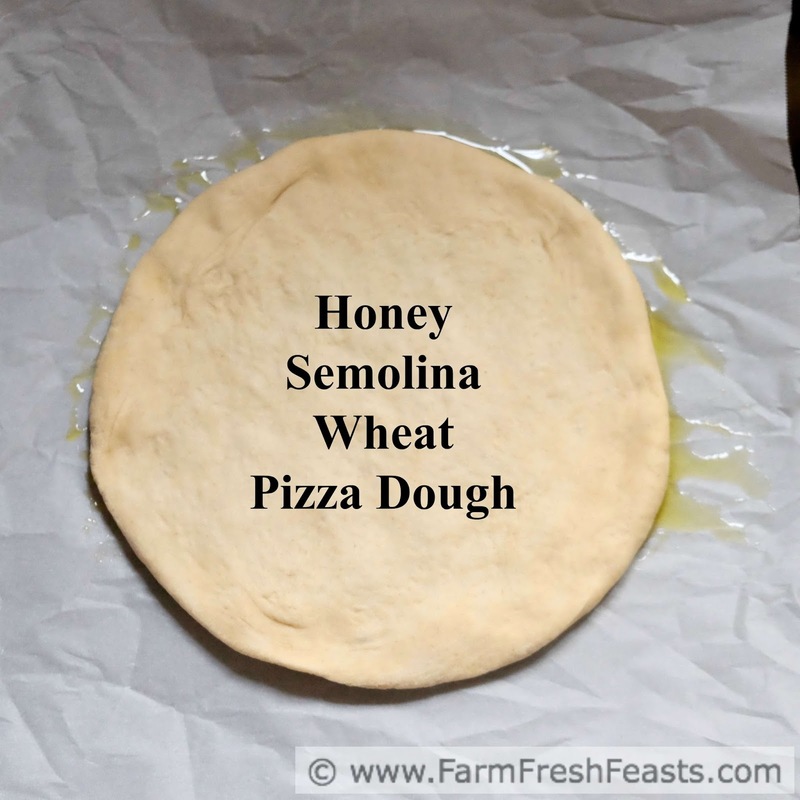 A recipe for basic pizza dough, with a bit of honey, semolina and wheat flours to make a nice chewy crust that stands up to whatever toppings you'd like to use. 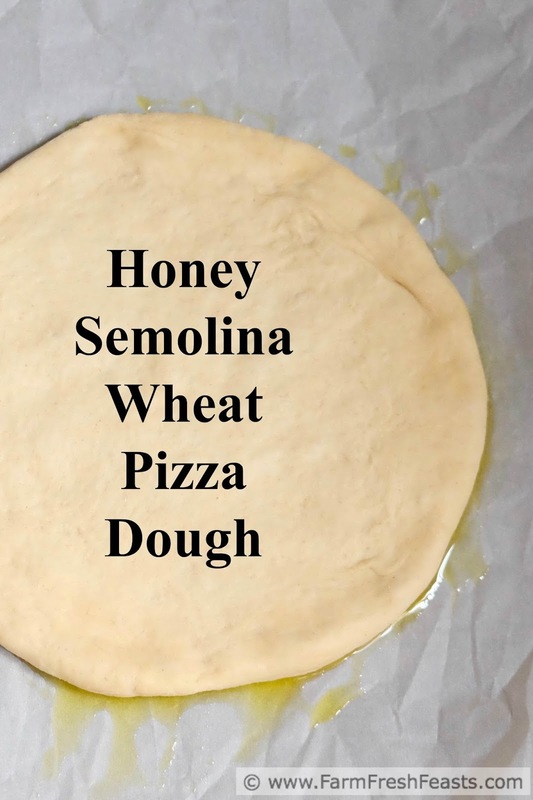 This pizza dough is a good basic dough. I've been making it weekly for a couple of months now, and it fits with a variety of toppings and sauces. It's sturdy enough for a heavier topping or deep dish pizza, mild in flavor, and has a nice chewy crust. Pizza dough is best made ahead. The dough has time to relax and chill, and so do you. Usually for me that means I throw the dough together sometime on Thursday for our family's Friday Night Pizza Night. Lately I've pushed the envelope on what 'make ahead' means. Typically I'm mixing up dough while my first cup of tea steeps, around 6 am, shaping it into a ball and bagging it, then chilling until I get off work or the kids get home from school. One of us transfers the dough bags to the counter to sit for 1-2 hours until it's back to room temperature. At dinnertime it's time to shape it, top it, and bake it as described in the photo exhaustive My Pizza Primer post. I wish I could recall what cookbook I pulled the inspiring recipe from. I discovered this in my Notes app on my phone last winter, so I know it came from a physical book I held and typed it into the app. I don't know if I got the recipe while perusing books in the bookstore or while scanning titles in the library. I modified what was in the Note a bit by adding malt powder, swapping Hi Gluten flour for the bread flour, and breaking down the 'all bread flour' amount to include semolina and whole wheat flours. Then I increased the overall amounts of everything so you can use a packet of yeast and make 3 pizzas at one go. Not needing 3 pizza crusts at once? Freeze one for a couple of months! This ball is pretty shaggy, and that's ok.
Over the past year (according to my Photos program) I've made this multiple ways. I started off dumping all the ingredients into the bread machine, but I've found it's faster to just use my stand mixer. I didn't notice a difference in the end result of any of these methods. If you prefer to dissolve the yeast in water in the bowl, then add the flours and other dry ingredients on top (my prior method) go for it. 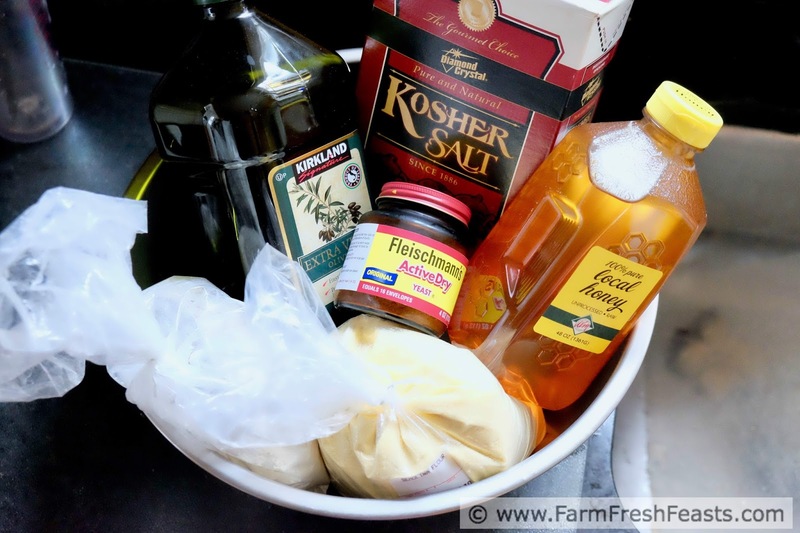 If you want to just dump all the dry ingredients (including yeast) in the bowl, starting to mix them, then adding the water/honey/oil as the dough hook turns. Both work fine. Just keep mixing until it forms a ball. Note: I weigh out my flours on a cheap digital scale (from Bed Bath & Beyond using a coupon). It's easy--pop the bowl onto the scale, zero (or tare) it out, add flour until you reach your target weight. Then zero it out and add the semolina flour, zero and add the whole wheat flour. Then pick the bowl up and continue with your recipe. If you don't--yet--have a kitchen scale I've included cup measures. Shaping the dough into a ball helps to smooth it out. For more pizza dough recipes and pizza topping ideas, please see my Visual Pizza Recipe Index. It's broken dough into vegetable toppings, pizzas with meat, with fish, and even savory pizzas with fruit. I'm sharing more recipes on my Pinterest boards, follow me there. If you like a good peek behind the scenes like I do, follow me on Instagram. Need a good read? I'm sharing articles of interest on my Facebook page, follow me there. Want to know How to Use This Blog? 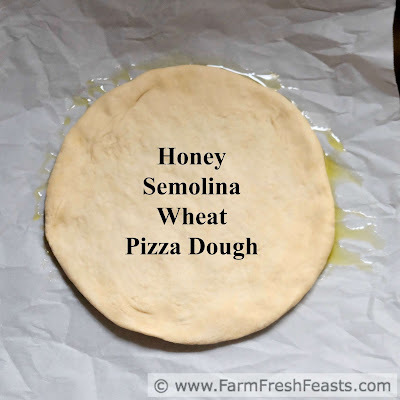 Let's see--locally sourced hi gluten and semolina flours plus local honey. 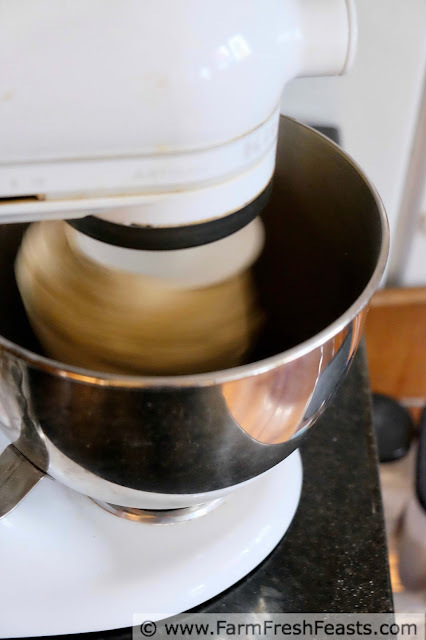 In the bowl of a stand mixer or a large bowl, measure out dry ingredients. 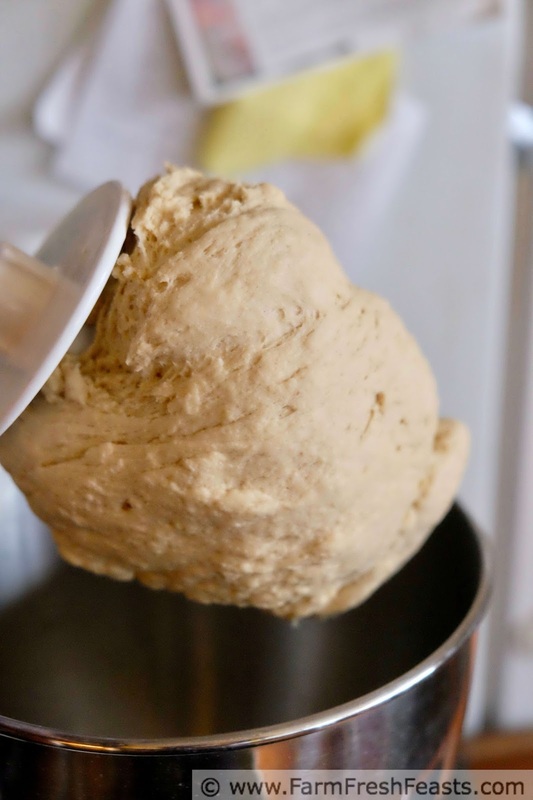 Start mixing using a dough hook, and add in wet ingredients. 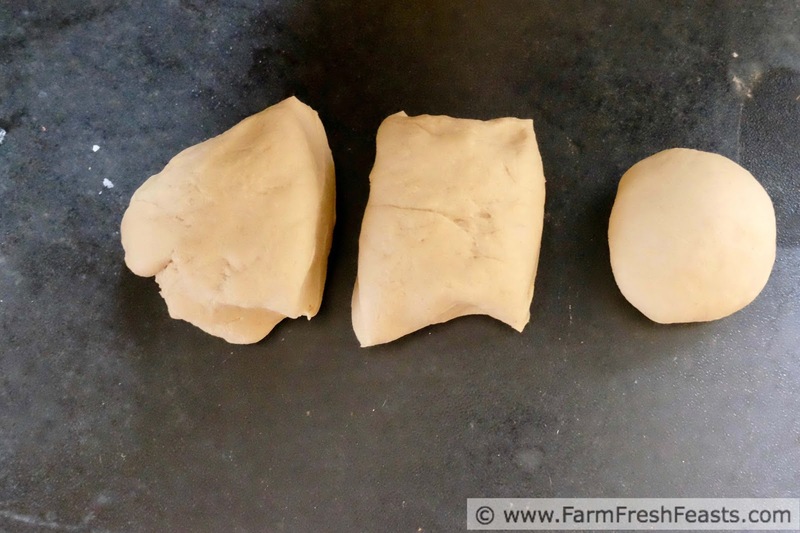 Mix until a ball forms around the dough hook. Transfer to a counter top, cutting board, really any firm surface will do. Shape into a fat log and divide into 3 parts. Shape each third into a ball. Transfer to an oiled plastic bag and chill for 8 hours up to a couple of days. 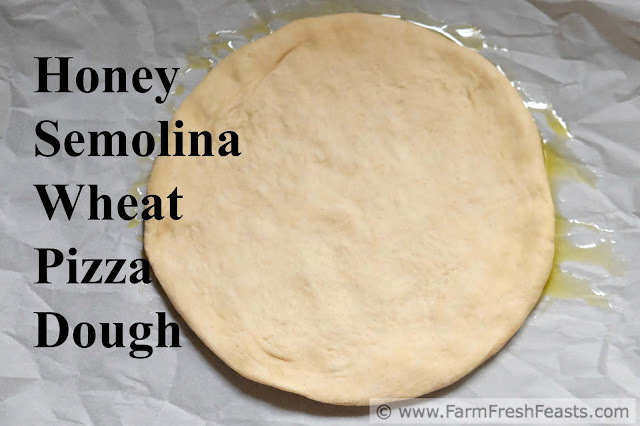 Take the dough out of the refrigerator and let it come to room temperature on a kitchen counter for at least an hour (it's more like 2 around here) prior to preheating the oven or grill and making your pizza. To bake, preheat oven (with a pizza stone if you've got it) to 450 degrees Fahrenheit for 30 to 45 minutes. Stretch out the dough on a sheet of parchment paper (I use olive oil to make it glide easier). Top with your favorite toppings. Slide the parchment paper and dough onto the preheated stone and bake for 5 to 8 minutes. Shimmy the parchment out from under the dough, and bake directly on the stone until cheese is browned and bubbly, another 3 to 5 minutes. Cool on a rack for a couple of minutes, then slice and serve. I really need to start making my own dough. The intention is there. Intention is the first step! Good luck. Once you develop the routine and realize how quick it is, it just flows from there.